What They Say....How do you move on after losing the person you loved? How do you build a life worth living? What I Say....I loved Me Before You. I actually read it on a flight to Hawaii and embarrassed myself by sobbing uncontrollably in front of an airplane full of strangers. But I think I was one of the few that wasn't clamoring for a follow up book. But once I saw it had been written, how could I resist? I do love Jojo Moyes, and I'd read anything she's written. This one wasn't my favorite though. 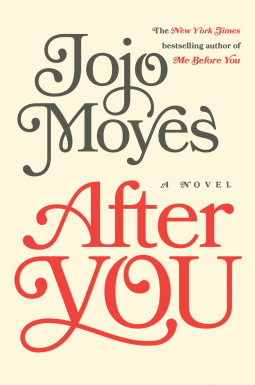 I think I would have rather left the story at the end of Me Before You. In my mind, Louisa had gone on to live a meaningful, daring life that Will challenged her to. To see that she is back to living a completely uneventful life was a pretty big letdown. It was actually depressing me. The introduction of Lily is a new twist, and her story was really heartbreaking. I don't want to give any spoilers, but when she was close to rock bottom, and her father's friend appeared to help her, I kept thinking, "Please don't be a bad guy, please don't be a lech." Of course he was. I actually became more invested in Lily's story than Lou's. I almost think the book could have been written from her viewpoint. This was a good book, and I'm glad that Louisa found peace. But what did you think? Are you glad there was a sequel? Or would have been happy with the ending of Me Before You?